A text on the topic of children with disabilities at nursery school which responds to the need for focus and concentration on a theme that is often described by nursery school educators and coordinators as critical, due to a lack of didactic material upon which to base professional reflection and good practices. From the definition disability from a legislative point of view regarding rights, with particular attention to the issue of social and scholastic inclusion, to the description of disabilities referring to the 0-3 age bracket, the volume examines the observation of the child with signs of difficulty, the critical elements of autonomy, interaction / communication with others, play and playfulness, and the possible measures and strategies that can be implemented to facilitate the child’s development in these areas. 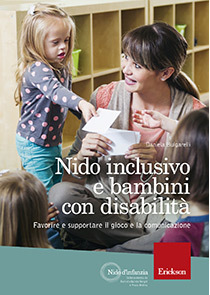 Interviews with experts and parents as well as specific examples complete this useful book which provides support for educators to communicate with families and gives value to the role of the adult in helping create opportunities for children with disabilities from a “life project” point of view.